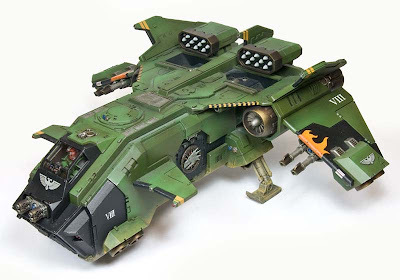 With the release of the new Space Marine Storm Eagle Assault Gunship, the options to add a flyer and dare I say the push to add more than one to your space marine army is slowly growing. The Storm Raven broke the ice or was it the Vendetta for Imperial Guard that got us started? There once was a time when we had no flyers in the game. It was boots on the ground and tanks. Tanks of all sizes. Back when the Rhino was king. I'm sure the new Storm Eagle is well worth its point cost for the options it comes with. Forge World has posted the experimental rules for this beauty. If you're going to introduce something new for Space Marines, you better make it worth a player's while to get at least one for his force. Especially if they're an expensive kit. It's not like we've got another option for a Landspeeder here. This kit is big both in cost and size. Download the Forge World Storm Eagle experimental rules here. How do you transport something like this? You're looking at a case for just one model at this point. Maybe two in one bag stacked on top of each other if you're lucky. My trip to the hobby store to play a few games of 40k is starting to look like my annual two week vacation to the beach. I have to load up the car with a half dozen army cases just for my 1500 point army. You'd think I was moving out of my house if you saw all the suitcases I was loading into the trunk. I contacted Daryl at KR Multicase to see what he had in terms of being able to protect these larger vehicles. 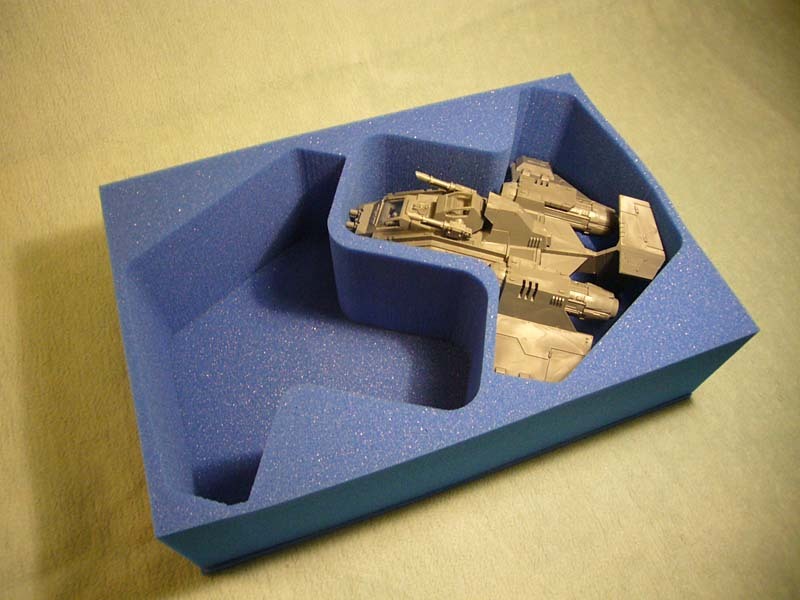 He make specific foam trays for these kinds of models. They still take up a good bit of space overall, but I suspect owner's aren't going to complain with the amount of money and time they've got invested in these vehicles. I know I like to have my basic rank and file guys protected so there's no doubt in my mind I'm protecting one of my flyers. Where do you put it on the table? I have trouble finding spots for my Land Raiders sometimes. Where do folks put their flyers? Do they just hang out in the air while you play? Do these things have the option of flying "off" the table or does it have to hover patiently waiting for it's turn to scoot ahead a few inches in your movement phase? At this rate, a couple of Storm Eagles, a Storm Raven and maybe a Vendetta and the space over your gaming table starts to look like the airport during the holidays. Planes stacked all over the place. Do they have rules for mid-air collisions? Now that would be cool. 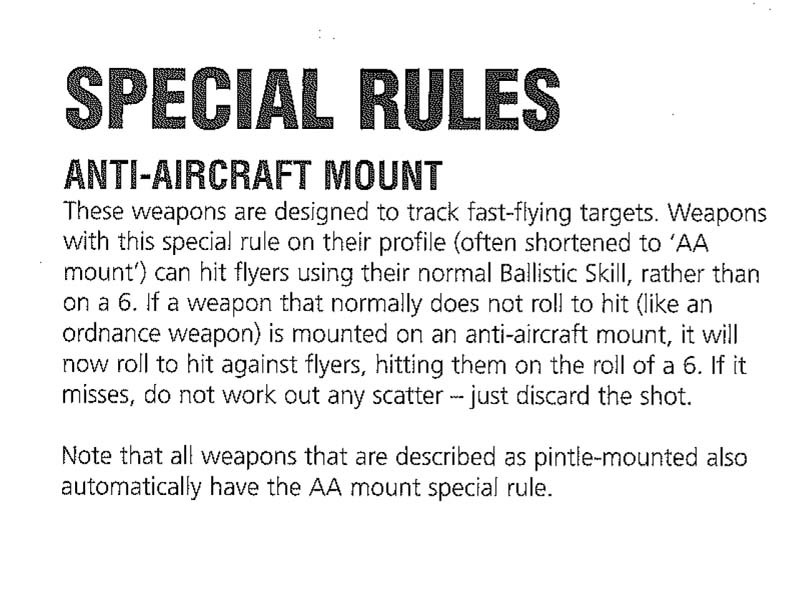 I went through the flyers rules that I could find and unfortunately, I don't see anything for mid-air collisions. If I happen to bring one down with a lucky shot, it crashes off the table as well which is a bummer. Download just the Flyers Rules here. 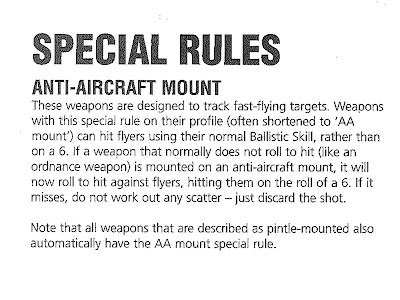 I did find out that pintle mounted weapons counted as being "AA-mounts" or anit-aircraft equivalent in the GW Apocalypse book. That means you have a better chance of hitting those pesky things cruising around overhead. I think the only things pintle mounted on my Land Raiders are the multimeltas. At least those stand a chance of dropping one of these birds from the sky. When it comes to Apocalypse, all bets are off. Bring your titans, your bombers, your super gargantuan monster thingys... we'll play out in the front yard if need be. We can even use the neighbor's front yard if we have to. But for regular games (I'm talking the 1500 point range), how big can the models get before they become unwieldy on the tabletop? Maybe 6th edition will see an increase in the table size. Maybe the table size will scale up as your points increase to accommodate the number and size of models. There has to be a point when the size of the board becomes a hindrance to using these models. I hang my head when I think of having to paint a Rhino. A Land Raider is a 6 month project. I can only imagine having to paint one of these. You almost have an airbrush or some kind of spray paint to get one of these done in any reasonable time. There's no doubt they make stunning centerpieces for a force though which means you'll want to lavish all kinds of attention on it including freehand, weathering, split color schemes and on and on. Don't get me wrong, I think the Storm Eagle is a cool model. I just hope that the rest of the game keeps pace with the new models. From the sizes of the boards we're playing on to the rules for flyers (I still want mid-air collisions) to the rest of the models and stuff we'll need to defend against these things looming overhead. Looks like I'm going to need some more anti-aircraft stuff now. I really don't rate the experimental rules for this thing (It's like a really, REALLY expensive Vendetta). 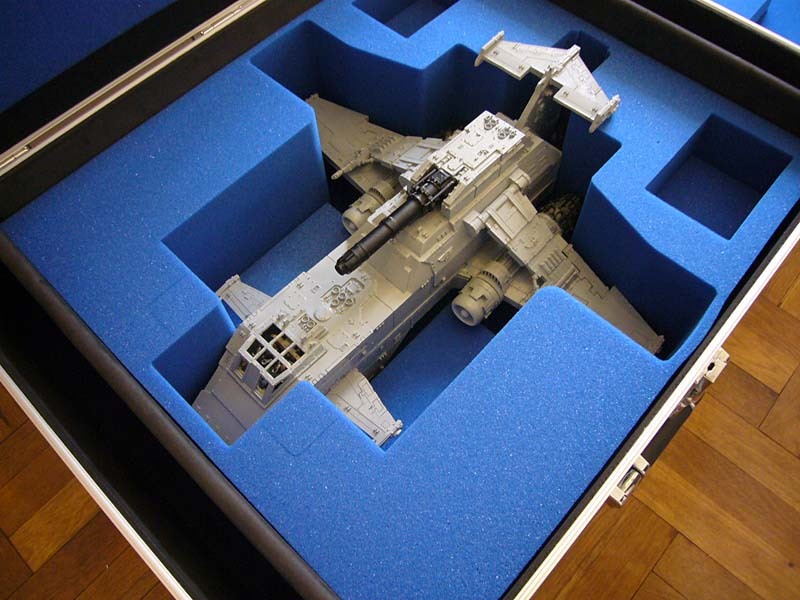 However, I'd love to have one as a centrepiece for my Space Marine chapter - I'd never fork out for the Thunderhawk, so this seems a good substitute. I'm very impressed with how good they've made the "stunted" Storm Raven kit look. Thanks for the StormEagle stats and rules, Ron!! 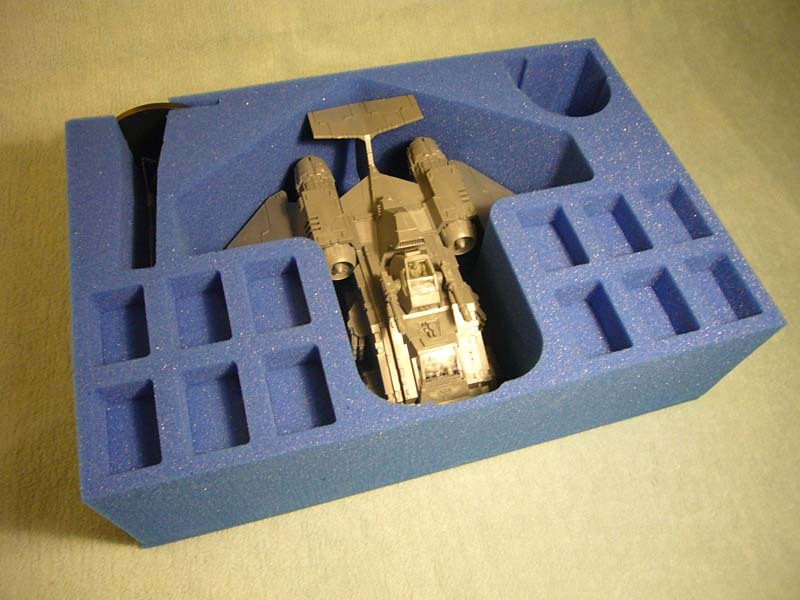 Ant: It's like a mini Thunderhawk for those of use who can;'t afford the big boy. Wolfen: You're welcome. They're available elsewhere, but I figured I'd add them here for folks as well. Actually I know a local game shop here that took a Thunderhawk and wrecked it and made it into a beautiful terrain piece. It is amazing! When asked why, they said it might only get used once in a blue moon for gameplay, but that terrain piece is used almost every time there is a game there. The Stormeagle looks impressive though, but I do hear you about the length of time it takes to paint a model that size, sometimes you do need an airbrush to get most of it done, which can be a problem if you cant get one! You make a lot of valid points Ron. These things (flyers in general) are bigger and badder looking on the tabletop than pretty much anything else, except maybe a Titan. And think of the scales that speaks of on our tables, I mean seriously, a landraider is huge. But I can't wait to see these things hitting our tables, and I can't wait to see what happens when you get your hands on some, it'll be simply epic. I run 2 Valkyries and a Vendetta with my IG, and sometimes it can get tough to place them. Although, I only play them as skimmers, not flyers. My biggest gripe is that a 24" move doesn't always get me to where I want to be, or I have to cut my move short because I can't place it over certain terrain or enemy units in the way. The base size isn't hard to fit on the table, but it's when they start getting imobilized and wrecked that you start having placement issues. Fayte: I suppose they're right... it's far more likely to be used as terrain than anything else. I don't have an airbrush right now, but I'd be tempted to get one if I had a model like that to paint. legoss: I'm not sure I'll see one anytime soon. I have a pair of Land Raiders to paint this summer first. Spyrle: So you're saying a savvy opponent could minimize where you could place your flyers/skimmers by how they place theirs on the table? Great article, Ron, and I agree with pretty much all you say...as it happens I've not yet invested in a flyer. I don't quite know why, apart from a general lack of funds. Radical Edward: They (tanks) may very well be these days. That and the units they know will sell well (terminators). I too like playing on smaller boards like 4x4 as it really adds to the violence with some scenarios. Muskie: See now that's cool, you guys can use FW stuff in local tournaments. But... you've got a good idea waiting until you knock down some of the models you already have staring at you. Was talking to a GW manager yesterday about the Storm Eagle, and i asked him if he was planning on getting one for his marine army and he said that he would not be buying one as it looked "a little bit Tau". since he mentioned that i can totally see it. the back wings section and the top missles are very FW Tau flyer design. GavCee: That's interesting... never saw it until you mentioned it. I definitely want 1 (or 3) of these for my Wolves. Definitely an airbrush piece as well, though lately I use mine for almost every model, even if its just applying an initial undercoat. Its an absolute timesaver on larger models though, easily cutting hours of time down to 30-45 min in some cases. An airbrush is useful but not required for a piece this size -- I've painted Baneblades with a brush. On my Vendetta, I used an airbrush to base coat, but the remaining 6 layers were just a large drybrush. pdelair: Three of them, holy cow! I'd love to learn how to airbrush as I think it would help my painting. Hudson: Do you think it was "easy" to paint with a brush (using drybrush methods) because of the sheer surface texture and detail on the tank? Something to mention in regards to flyer placement on the table - every ruling I've ever seen from GW has specified that the bases are the only "footprint" that matters. I've seen a fair few players at events with telescopic stands for the flyers, so that two flyers can be next to each other but at different altitudes. This also stops the abuse mentioned earlier about using wingspan to deny placement of other flying vehicles. Some (most?) people aren't going to be willing to replace the GW flight stand though, so it's not a solution for everyone. Ant: Now that brings up some issues as well. Does altitude give any additional bonuses? I'm thinking in terms of range. Too high might as well be the same as too far away when you're measuring weapon range. A flyer 8 inches off the ground is much closer than one that is twenty. And with a telescoping stand, you literally could stack the flyers on top of each other and afford the one on top some potential cover if you will by the one under it. This opens up a whole new aspect. For mid-air collisions it would be great with a Caestus Assault Ram, CAR, because it is designed to to do that and would be great to see if someone does it in a game against the Storm Eagle. deathwatch: Come to think of it, you could do it. You'd just have to use the regular vehicle ramming rules I suspect. Ron: At the events I've been at it's been that the "official" stand height gives the ranges / LoS for the weapons. You just ignore other flyers (as they are not stationary when firing) above/below you. It's a very "house-ruley" solution, but it helps. Without the ability to fire at any point in your movement it's probably the best solution for 40k so far. Sixth may well give us more tools to fix the problem. Ant: Ahh... I see. I was hoping for something a bit more dramatic, but it sounds like your house rule is probably the best way to go about it for now. Here's to hoping sixth brings us mid-air collision rules then! 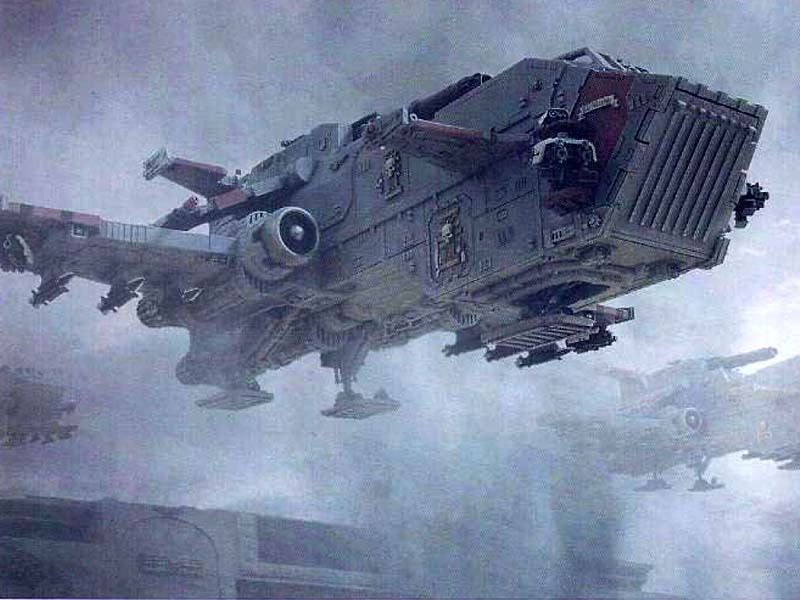 I'd love to paint an Inquisition Thunderhawk....talk about shock and awe! Anon: That would be quite a spectacle. 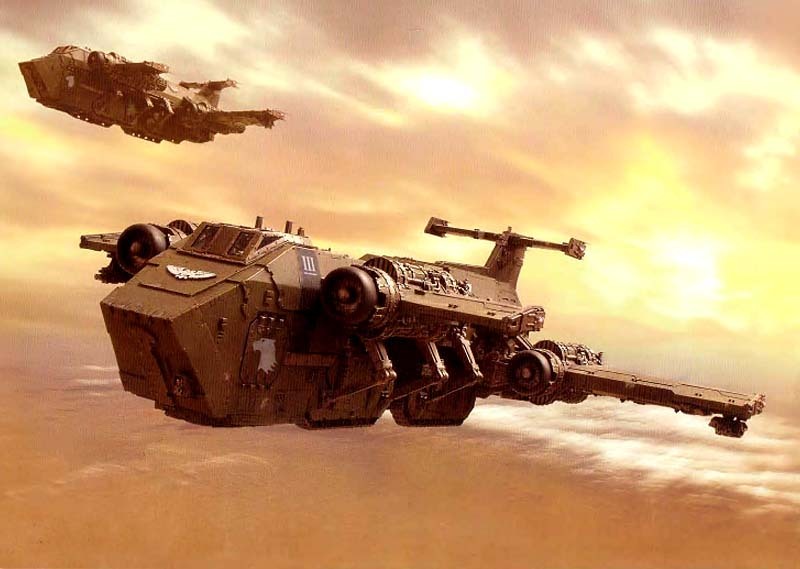 Most of us are used to seeing a squad or so of Grey Knights, maybe a Storm Raven or two, but a Thunderhawk would be something in a much different league.